SAHAYA Nepal e.V. homepage in English - SAHAYA Nepal e.V. Webseite! Welcome to the homepage of SAHAYA Nepal e.V. 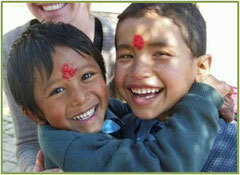 "sahaya" means in Nepali "supporter" and "helper". That's exactly what we aim to be: we enable and support local organisations in Nepal by providing scholarships and education to street kids and children who never had the chance to go to school without your help. How we do it you can read at the following pages. You may support defined projects by a donation or you can start sponsoring a scholarship for a child; in any case we ensure that your contribution reaches the destination to a 100% . We work with partners we know by person in a long-term collaboration ensuring mutual trust and engagement. We may also assist in case you like to volunteer in Nepal: we arrange for contacts to our trusted partners. We hope you will like our engagement and will consider to yoin us! Welcome to SAHAYA Nepal e.V. !